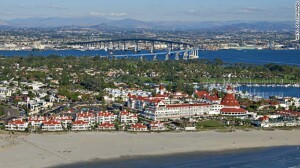 Coronado, a small, tight-knit resort community on San Diego Bay that’s home to approximately 25,000 residents, is probably best known as the location of internationally-renowned Hotel Del Coronado. The sprawling luxury hotel, built in the late 1800s, is a National Historic Landmark, one of the world’s finest resorts and is popular with residents and visitors alike. Coronado’s downtown and surrounding core neighborhood are known affectionately as “The Village” and are cafes. Culturally rich for such a small community, the town hosts two playhouses, and its Coronado High School is also home to Coronado School of the Arts. Homes range in size from charming cottages to Victorian mansions, and the nearby beach has been named among the best in the U.S. by several publications.